Useful if you need to rename a large number of files in a directory accordingly to their ID3 description and a given "formula" (e.g. (%Track) %Artist - %Title). Such a function is pretty "smart", ID3 renamer lets you assembly the filename as you wish and use the variables from the ID3 tag in the filename. It is required you mark them with a "%" at the beginning, followed by an ID3 section label (literally - i.e. the first letter is capital. ...... (e.g. (%Track) %Artist - %Title). Such a function is pretty "smart", as it lets you assembly the filename as you wish and use the variables from the ID3 tag in the filename. It is required you mark them with a "%" at the beginning, followed by an ID3 section label. * Do you have loads of MP3 files in a directory and need to write a single common piece of information into them (e.g. the interpret or the album name)? You can type it in there manually, but this won't make you very cheerful if the amount of files is large. Using ID3 renamer, everything is a matter of a few mouse clicks. * Do you need to clean some portion of the ID3 tag? Use ID3 renamer and don't erase like every single line. Do you need to remove the diacritics? Choose the advanced options and it's already done. 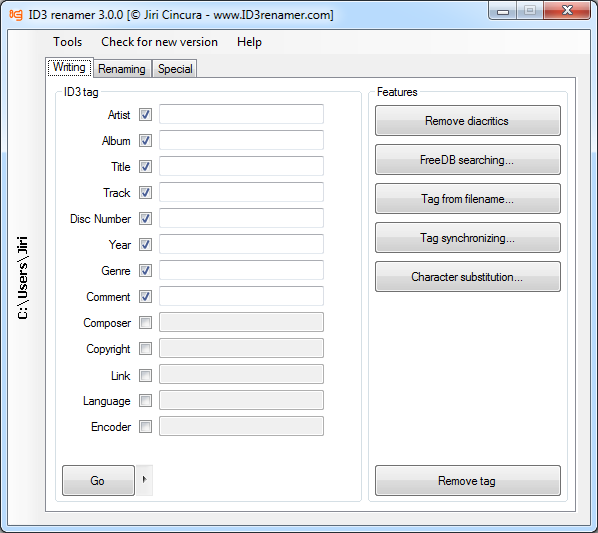 * ID3 renamer can also create a new tag if there is none in the file yet; it lets you easily write into new files too. All-in-one batch rename utility for files, photos & mp3's. Qweas is providing links to ID3 renamer 4.2.0 as a courtesy, and makes no representations regarding ID3 renamer or any other applications or any information related thereto. Any questions, complaints or claims regarding this application ID3 renamer 4.2.0 must be directed to the appropriate software vendor. You may click the publisher link of ID3 renamer on the top of this page to get more details about the vendor.